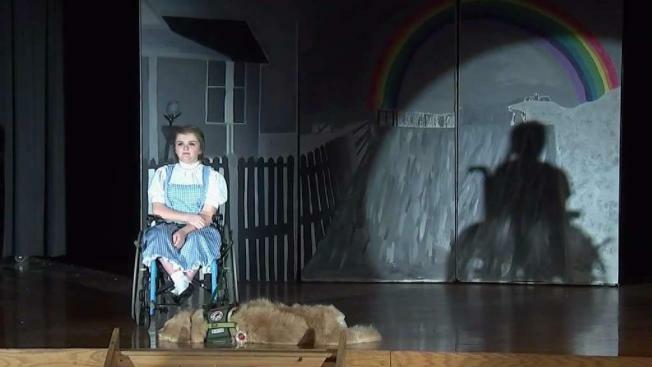 A New Jersey high school senior who uses a wheelchair is playing Dorothy in a new production of "The Wizard of Oz" — and her service dog is playing Toto. Pat Battle reports. A New Jersey high schooler who uses a wheelchair is starring in a new production of "The Wizard of Oz" — and her service dog is too. Hasbrouck Heights High School senior Erin Bischoff was born with osteogenesis imperfecta, also known as brittle bone disease, and uses a wheelchair. That hasn’t stopped her from playing Dorothy in her school’s stage production of the beloved classic. Her service dog has his own starring role, playing Dorothy’s iconic sidekick, Toto. The show brought down the house at a dress rehearsal, with one audience member calling it "absolutely inspirational." It’s the first time Erin has been cast in a lead role, but she maintains it "isn’t really a big deal at all." "It’s just like any other student who’s going out there," she said. "It’s more about acceptance — you just treat everyone the same. There’s really no differences." The cast and crew worked with the actor playing the Cowardly Lion to make sure he didn’t startle Erin’s dog, director and drama club advisor Paula Jacobs noted. "We had to work with the actor playing the Lion, making sure he’s not making contact with [the dog] when he’s rushing Erin, because the dog’s natural reaction is to protect Erin," Jacobs said. Erin’s principal, Linda Simmons, praised the young actress’ performance. "You talk about true grit? She has grit, in every bone of her body, she really does, and she’s a strong young woman," Simmons said.